Our friends at SafeGuard armor helped us put this article together with their expertise in body armory. Hopefully it is useful for those that are needing high threat protection. 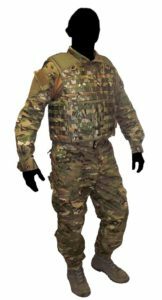 Body armor is a surprisingly useful piece of equipment that is capable of protecting the wearer against a great deal of threats beyond just projectiles from a firearm. For example, many Law Enforcement Officers have been involved in car crashes that would have been fatal if it were not for their body armor. Indeed, even high-caliber weaponry can be stopped with the right body armor, and rifles in particular may not pose the threat they once did. Of course, these are still incredibly deadly weapons, and some currently cannot be stopped no matter how strong the armor is. Furthermore, the so called ‘bullet proof vest’ can never guarantee your safety, and should not be a substitute for awareness and caution. In that vein, here are some of the most famous, popular, or otherwise notable rifle cartridges and what protection body armor can give you against them. The .223 Remington (5.56×45mm NATO) was developed to fit the action length of the then new M16 service rifle. The .223 became popular in part due to the easy availability of brass at the time. Shortly after military acceptance of the M16, the civilian semi-automatic version, the AR-15 became available, making the .223 cartridge even more popular. The .223 Remington is almost identical with the 5.56x45mm NATO cartridge in terms of external dimensions. However, they differ in both maximum pressure and chamber shape. The 5.56 chamber specification has also changed since its adoption. The current military loading (NATO SS-109 or US M855) uses longer, heavier bullets than the original loading. This has resulted in a lengthening of the throat in the 5.56 chamber. Thus, while .223 Remington ammunition can be safely fired in a rifle chambered for 5.56×45mm NATO, firing 5.56 ammunition in a .223 Remington chamber may produce pressures in excess of even the 5.56 specifications due to the shorter throat. For this round you will need a level III protective vest. The .308 Winchester is a rimless, bottlenecked rifle cartridge and is the commercial cartridge upon which the 7.62x51mm NATO round was based two years after the .308’s release, which itself was based on the military T-65 development. Although very similar to the military 7.62x51mm specifications, the .308 cartridge is not identical, and there are special considerations that may apply when mixing these cartridges with 7.62×51mm NATO and .308 Winchester chambered arms. Their interchange is, however, considered safe by the Sporting Arms and Ammunition Manufacturers Institute (SAAMI). The .308 became the most popular big-game hunting cartridge in the world, and is commonly used by Military Snipers and Police Sharpshooters. The relatively short case makes the .308 Winchester especially well-adapted for short-action rifles. To protect against the .308 Winchester you will need a vest at Level IV. The 7.62x54mmR is a rimmed rifle cartridge developed by the Russian Empire and the longest serving military-issued cartridge in the world. This round is one of the few standard-issue rimmed cartridges still in military use, and in 2011 the cartridge reached 120 years in service. As of December 2013 the 7.62×54mmR is mainly used in sniper rifles like the Dragunov SVD sniper rifle and machine guns like the PKM. The round has erroneously come to be known as the “7.62mm Russian” (and is still often referred to as such colloquially), but, according to standards, the “R” in the designation (7.62×54mmR) stands for Rimmed, in line with standard C.I.P. designations. The name is sometimes confused with the “7.62 Soviet” round, which refers to the rimless 7.62×39mm cartridge used in the SKS and AK-based (AK-47) rifles. Because of performance similar to the iconic American .30-06 cartridge, with its similarly rich military and historic heritage and amazing longevity, the 7.62×54mmR is nicknamed “the Russian .30-06” by some. It is also one of the few bottlenecked, rimmed centerfire rifle cartridges still in common use today. Most of the bottleneck rimmed cartridges of the late 1880s and 1890s fell into disuse by the end of the First World War. For this round you would need a Level IV vest for protection. The .30-06 Springfield cartridge, 7.62x63mm in metric notation, and called “.30 Gov’t ‘06” by Winchester, was introduced to the US Army in 1906 and remained in use for the next 75 years. The “.30” refers to the caliber of the bullet, and the “06” refers to the year the cartridge was adopted. The .30-06 remained the U.S. Army’s primary rifle and machine gun cartridge for nearly 50 years before being replaced by the 7.62×51mm NATO (commercial .308 Winchester) and 5.56×45mm NATO, both of which remain in current U.S. and NATO service. It remains a very popular sporting round, with ammunition produced by all major manufacturers. The M1903 Springfield rifle, introduced alongside the earlier .30-03 cartridge, was quickly modified to accept the new .30-06 Springfield cartridge, designated by the US military as the M1906. Modifications to the rifle included shortening the barrel at its breech and resizing the chamber, so that the shorter ogive of the new bullet would not have to jump too far to reach the rifling. This round also will require a vest at Level IV for protection. The .300 Winchester Magnum (also known as .300 Win Mag, 300WM, or 7.62×67mm) is a popular, belted, bottlenecked magnum rifle cartridge that was introduced by Winchester Repeating Arms Company in 1963 as a member of the family of Winchester Magnum cartridges. The .300 WM is designed to fit a standard length action, and is based on the .375 H&H Magnum. This round is extremely versatile and has become popular with a variety of users, from hunters and target shooters to the Military and Law Enforcement. The .330WM remains the most popular .30 cal magnum among American hunters, despite being outperformed by a number of other rounds. As a testament to its accuracy, since its introduction it has gone on to win several 1,000-yard (910 m) competitions. The .300 Winchester Magnum requires a Level IV vest. The .338 Lapua Magnum (8.6×70mm or 8.58×70mm) is a rimless, bottlenecked, centerfire cartridge developed for the military long-range sniper. It gained popularity through the 1990s and then after being used successfully in the Afghanistan and Iraq Wars. It can be used as an anti-personnel or even an anti-materiel round. However, its potential as an anti-materiel round is limited due to its lack of power compared to rounds like the .50 BMG. The .338 Lapua Magnum rounds issued by the British Military were used by British Sniper Corporal Craig Harrison in the longest confirmed sniper kill in combat, using a L115A3 Long Range Rifle at a range of 2,475m (2,707 yds). The current .338 Lapua Magnum cartridge was developed as a joint venture between the Finnish rifle manufacturer SAKO and the British rifle manufacturer Accuracy International along with the Finnish ammunition manufacturer Lapua, or more officially Nammo Lapua Oy, which since 1998 is part of the Nordic Ammunition Group (Nammo). The .338LM will require the highest level of protection, NIJ Level IV for any sort of protection. The .50 Browning machine gun (.50 BMG or 12.7×99mm NATO) was developed in the late 1910s for use in the Browning .50 caliber machine gun. It entered official service in 1921 and became a standard cartridge for NATO forces and many non-NATO forces in the year following. The cartridge is available in many variants, and is based on the shape of the .30-06 cartridge. The .50 BMG is used in a number of .50 caliber machine guns and sniper rifles, and is also available for use in some semi-automatic weapons. This round was used for the then longest-range confirmed sniper kill, before being surpassed 7 years later in 2009 by British Sniper Craig Harrison. John Browning had the idea for this round during World War I in response to a need for an anti-aircraft weapon, and based it on a scaled-up .30-06 Springfield design. The development of the .50 BMG round is sometimes confused with the German 13.2 mm TuF, which was developed by Germany for an anti-tank rifle to combat British tanks during WWI; however, the development of the U.S. .50 caliber round was started before this later German project was completed or even known to the Allied countries. This round will need a vest at Level IV.